News was dominated today by the fatal crash of a test flight of a Virgin Galactic flight in the Mojave Desert. Virgin Galactic is part of Billionaire Richard Branson's empire, the goal of this enterprise is to serve as a space tourism junket for rich slobs like global-warming believer Leonardo DiCaprio. How much greenhouse gas does a spaceship emit before it leaves the Earth's atmosphere? I've wandered a bit into the desert. Virgin Galactic is a tenant of Spaceport America, which is in southern New Mexico. Voters in two Land of Enchantment counties foolishly approved taxes--$40 million worth--to fund the hangar for space junkets for the rich. Why couldn't Branson and DiCaprio cough up the money instead? There is a lot of red and brown in this picture. 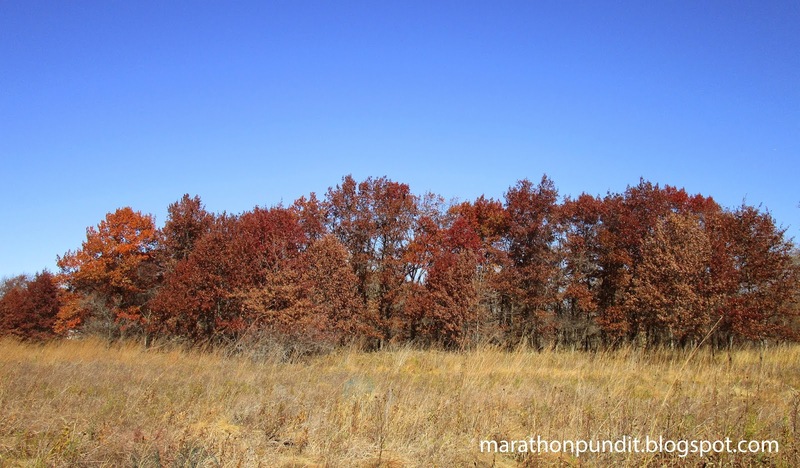 The red comes from various oak trees and the brown from native prairie grasses. The the beautiful blue sky just happened to be there. 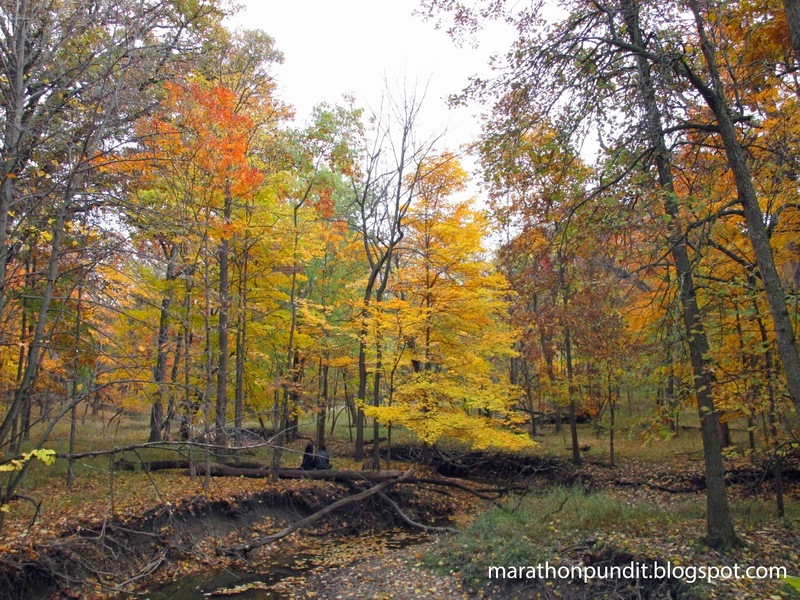 Photographed Tuesday at Morton Grove's Miami Woods. Illinois patriots: Don't vote for the failure. Choose success and Republican Bruce Rauner on Tuesday. Chicago Sun-Times strongly endorses Rauner for governor: "We're all in"
I'm looking out of my window right now. It's snowing. On Halloween. Earlier today the official Chicago weather station at O'Hare International Airport measured one-tenth of an inch of snow--the most snow on record for October 31.
Who did more for the education of African-Americans? Was it president who graduated from tiny Eureka College in Illinois? Or was it the one currently in office with two Ivy League degrees. A former black educator says it was the former. A former history and African Studies professor at historically black Delaware State University blames President Obama for undermining the education of black students. "When President Obama came into office it seemed as though the progressive, liberal Democrats [had] some type of concerted effort to accelerate the removal of African-Americans in these schools," Dr. Jahi Issa told Campus Reform. "Now under President Obama we are starting to see the decline of African-Americans in traditionally white schools. It didn't start with Obama but it did accelerate with Obama." At the same time, Issa credits President Reagan with doing more to help fund black teachers at Historically Black Colleges and Universities (HBCU). "African-Americans need to know that it was the Republicans, it was conservatives, the father of contemporary conservatism, President Ronald Reagan, who signed for the protection of HBCUs," Issa added. "He did that. It wasn’t the liberal Democrats and Republicans need to point this out throughout this upcoming 2016 midterm election. They have to make this known because a lot of people don't know this." Everything is broken in Illinois. And we've had enough of swindlers. Watch as a voter in the Quad Cities tries to vote for two Republican candidates. And it's not just happening in the Quad Cities. The Cook County Clerk's office told non-profit monitor Illinois Watchdog that the voting machine experienced a "calibration error" that "improperly assigned" Moynihan's vote. A similar calibration error seems to be at issue in Rock Island County. Schilling claimed last week to have received "17 calls of people saying the exact same thing." I've brought this point up several times but Illinois is in perilous condition because of 12 years of mismanagement by Rod Blagojevich and Pat Quinn. As for the latter, Quinn rammed through the General Assembly--with no Republican votes--a massive 67 percent increase in the state income tax, which the governor said would only be temporary. Quinn wants to make that tax, which is dragging down the Land of Lincoln's economy, permanent. 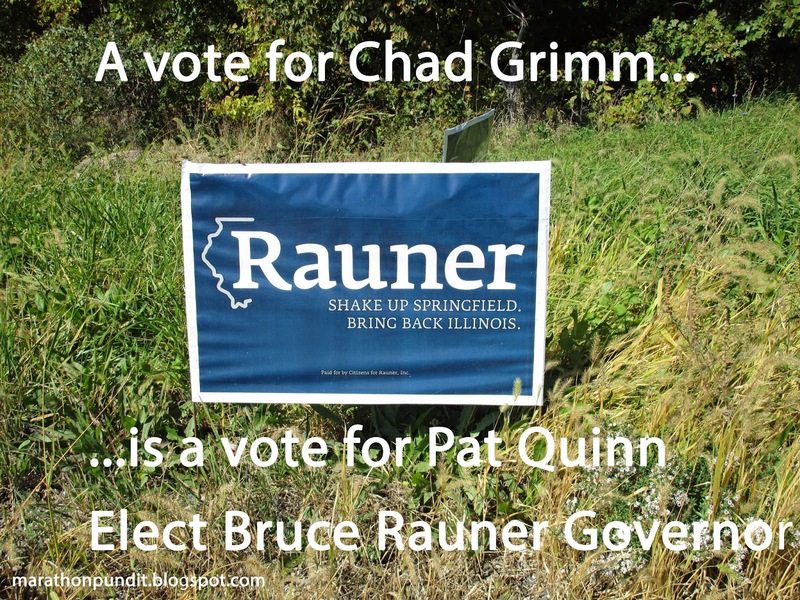 I have a better idea--vote for Republican Bruce Rauner, who wants to phase out the Quinn tax increase. 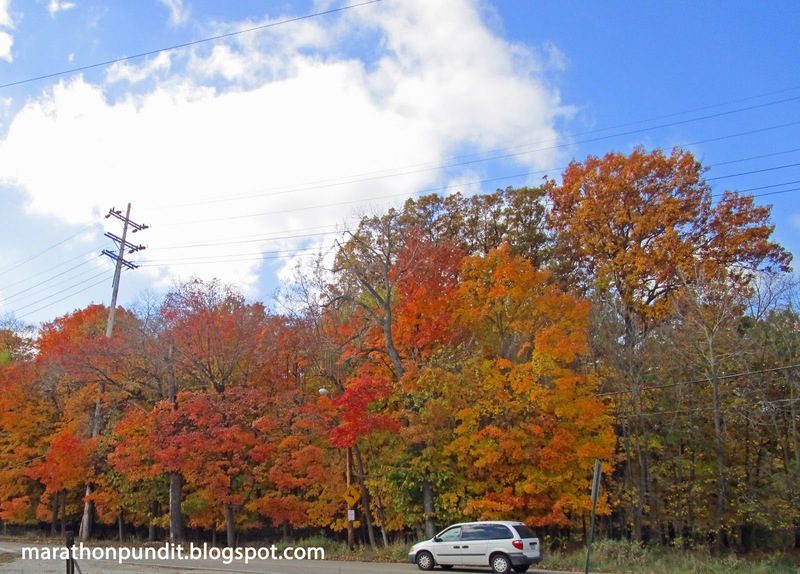 The House will get redder after Election Day? The Democrats are now forced to defend districts once thought safe. In one sign of Democratic concern, Vice President Joe Biden was heading to Massachusetts on Wednesday for a rally with Seth Moulton, who is trying to hold onto a Democratic seat against Republican Richard Tisei. Then Biden was traveling to California on Saturday to campaign in an open-seat contest east of Los Angeles that surprisingly looks closer than a sure-fire Democratic gain. "Heck, it's been so long since a Republican was elected to the Congress in Massachusetts, most Republicans don't know how to spell Massachusetts," joked Rep. Greg Walden of Oregon, chairman of the National Republican Congressional Committee. He said the GOP is spending 78 percent of its independent money in districts that Obama won. National Democrats are coordinating with local campaigns in Nevada, Hawaii and California in hopes of holding seats. In one example, the Democratic committee has bought $99,000 in radio ads for eight-term Rep. Lois Capps in her Santa Barbara-area race against Chris Mitchum, the son of the late actor Robert Mitchum. The GOP candidate has relatively little money still on hand for his campaign — $96,108 — but the contest is considered close. One of Chicago's most-famous streets--Lincoln Avenue--has its terminus at Dempster Steet in Morton Grove. Here's how it looked a few days ago. Despite it's use of "green-technology," an Asian carp processing plant Grafton, Illinois is giving off noxious odors, despite promises that it wouldn't stink. Decay is natural, by the way. 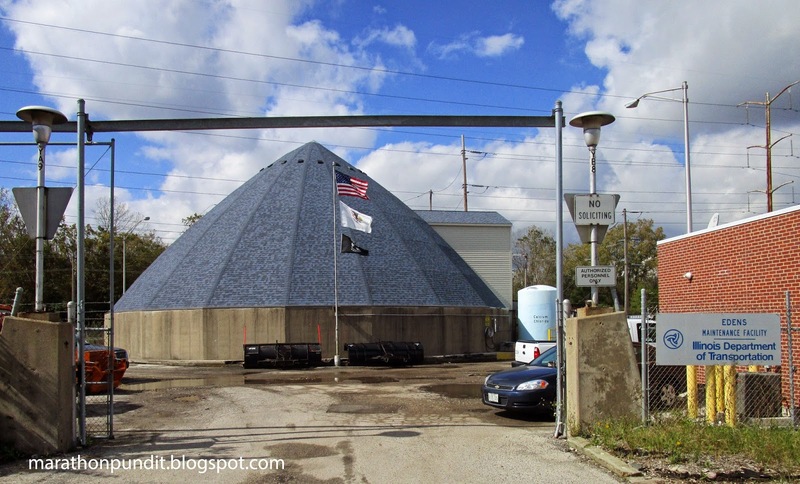 KDSK-TV is reporting that the owners of the plant, who have been given 30 days by local officials to to eliminate the smell, are now looking to swim out of the downstate Illinois River town. Big Labor is getting very desperate in Illinois. A labor union that endorsed Democratic Gov. Pat Quinn's re-election campaign in Illinois has donated money to an unlikely source — the Libertarian candidate running against him. The move by the International Union of Operating Engineers Local 150 is an apparent attempt to siphon votes away from Republican Bruce Rauner in the tight race. The group paid for glossy household mailers that describe Libertarian Chad Grimm as "the only true conservative choice for governor," noting his opposition to abortion and his support of gun rights. The same mailings describe Rauner as a "Chicago liberal." Let me repeat, this union endorsed a real Chicago liberal, Quinn. For the record, Rauner is a suburbanite. IUOE Local 150 spent $200,000 on the mailers and it has contributed $30,000 directly to the Grimm campaign. One more time: A vote for Grimm is a vote for Quinn. Americans for Prosperity, never a group that has been lacking in creativity, has its own truck, the Gov. Quinn Moving Company van. It's on its "Leaving the Land of Lincoln Tour" and it passed through Des Plaines this afternoon. Pictured in on the truck in brown is unpopular Chicago Democrat Pat Quinn, whose "Gov. Quinn Moving Company" has been "moving Illinois in the wrong direction since 2009." AFP's truck also notes, "Illinois has the second highest outbound migration in nation." The Prairie State also has the "worst credit rating in the nation," that "50% of Illinoisans want to leave the state," and that Illinois is the "third worst state for small business." If you want more of this malaise, then reelect Pat Quinn. I have a better idea, throw out this lifetime politician and replace him with political successful businessman and political newcomer Bruce Rauner. To follow the Republican Rauner on Facebook, click here. To follow him on Twitter, click here. Republican businessman Bruce Rauner is running for governor to rescue Illinois from lifetime politicians such as Governor Pat Quinn. Watch as Rauner and his wife, a Democrat, state their case. Unapologetic Chicago Sun-Times columnist Mark Brown, who mistakenly reported that Governor Pat Quinn' never said his 67 percent income tax hike was temporary, now tells his readers that he doesn't like the Chicago Democrat's Republican challenger, Bruce Rauner, because he is rich. Yes, Rauner has spent millions of the fortune he earned on his campaign. Has it occurred to Brown that Rauner believes in giving back to the community? Presumably Brown has no issue with public-sector unions contributing millions to the campaigns of Democrats. Those government union campaign war chests are stuffed with cash from the dues of public workers, who are paid with taxpayer dollars. As state agencies are "union shops," these employees have no choice in whether they want to even be in a union. Earlier this month the Czar of all the czars, President Obama-vitch, appointed an Ebola czar, Ron Klain, whose chief qualification for the position is that he his a national version of a Chicago ward-heeler. Oh, he also gets sick once in a while. But other czars exist. Obama has an Asian carp czar, John Goss. He'll be in Peoria this week. The city sits on the banks of the Illinois River, which has been pretty much taken over by the invasive fish. Goss will return to the River City next summer for a carp summit. When Obama and Goss are out of office, the Illinois River will still be dominated by Asian carp. Sure, the pesky fish still aren't swimming in the Great Lakes yet, but no need to worry: Obama has a Great Lakes czar to prevent that from happening. Waukegan, Illinois, the hometown of radio and television personality Jack Benny and author Ray Bradbury, is currently in the midst of a teacher's strike. Over 17,000 students haven't entered a classroom this fall there. As Bradbury phrased it in one of his novels, something wicked this way comes. School District 60 wants to resume food service at some of the schools during the strike, but legally cannot while pickets continue outside. While teachers' union president Kathy Schwarz will not stop the pickets, she has offered to pass out sack lunches to students outside - an idea the district says fails to comply with federal guidelines. "Honestly, if they came back with a proposal that is fair to teachers, we wouldn't have to worry about the students going to the schools to eat lunch," Schwarz said. Teachers are asking for a three-year deal that includes a 6 percent raise at the top end and 3 percent at the low end. Teachers say after years of pay freezes and low raises, the district can afford to give more. The school board disagrees. Waukegan is a mostly middle-lower class community that has not fared well in recent years. It probably hasn't occurred to the teachers union that the Lake County town doesn't have the money the teachers want. But of course the teachers are "for the kids." 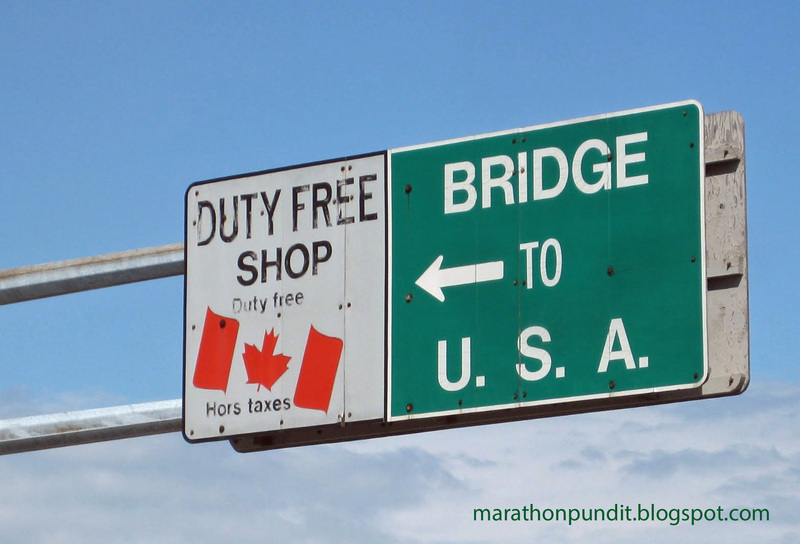 From Marseilles we move to Ottawa on the Illinois & Michigan Canal. 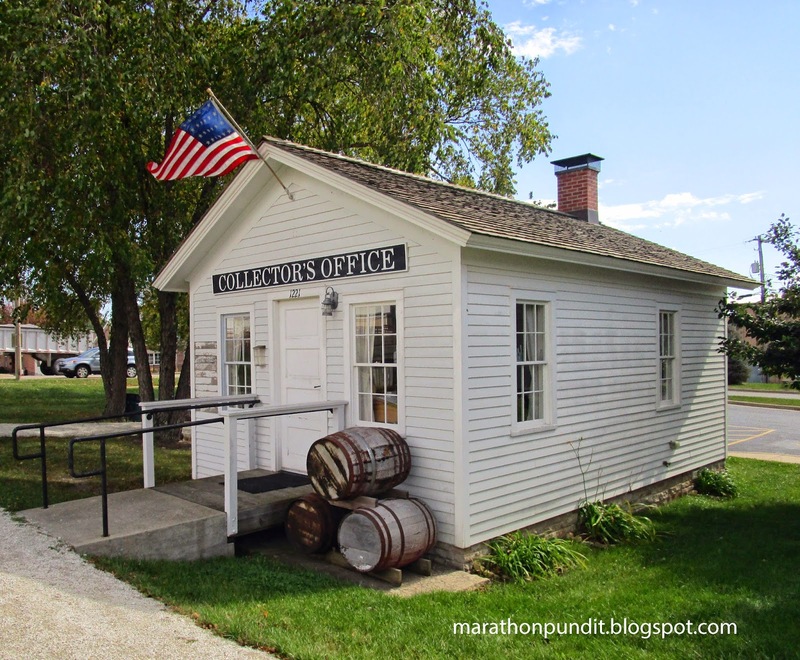 The seat of LaSalle County is best known as the site of the first Lincoln-Douglas Debate. 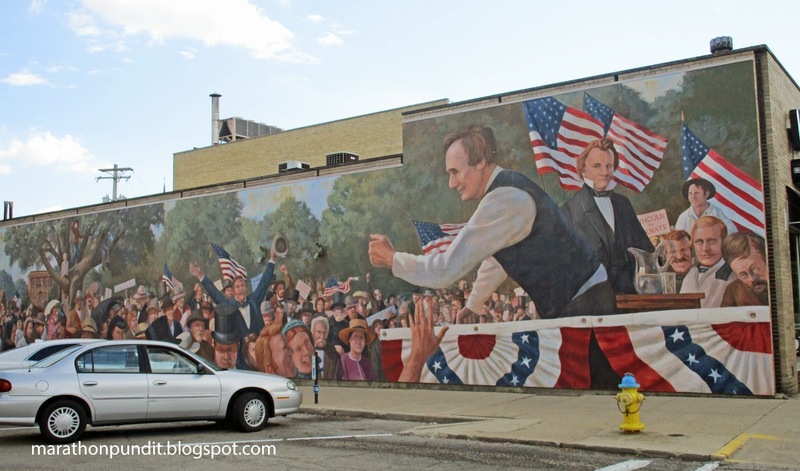 You probably know the story: In 1858, Abraham Lincoln of Springfield of the new Republican party was the opponent of incumbent US Senator and Chicago Democrat Stephen A. Douglas, one of the most prominent politicians in America. 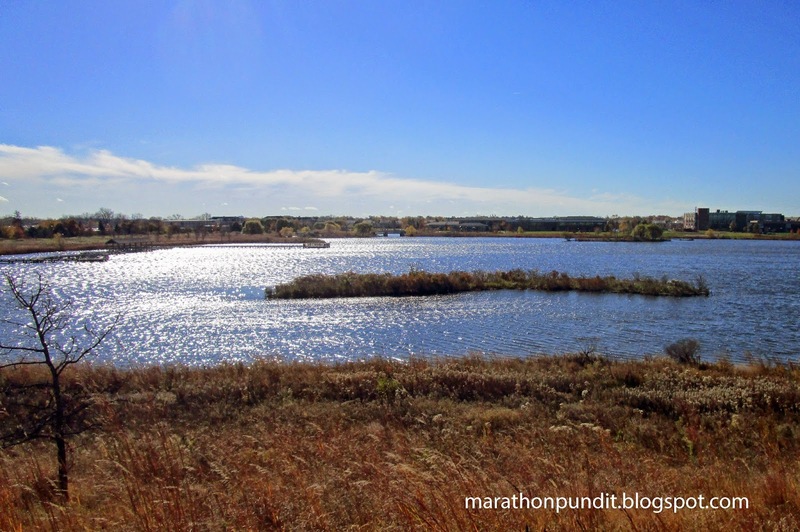 Prior to this month's visit, I had visited Ottawa a half-dozen times or so--mostly to run the now-defunct Ottawa Ten Miler. 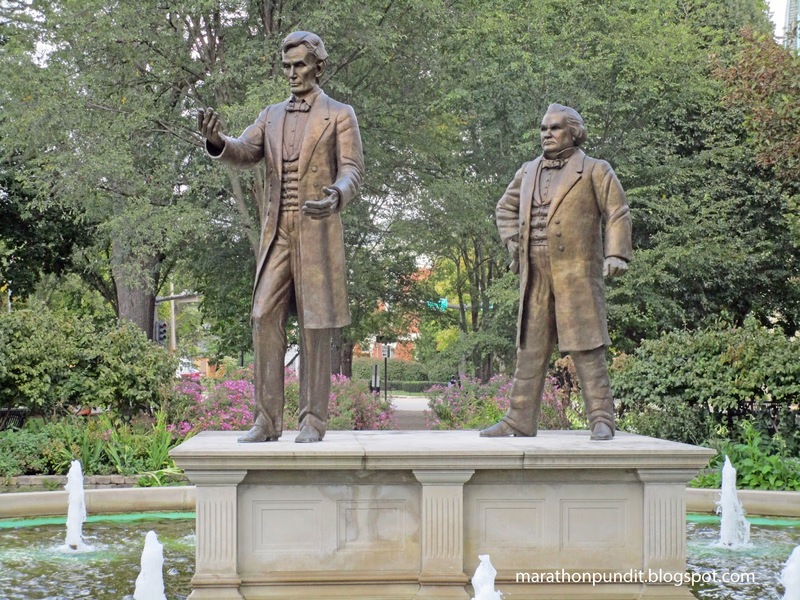 But I hadn't been there since the 1990s--and this bronze statue of Lincoln and Douglas wasn't at the debate site of Washington Square as it was dedicated in 2002. This historical marker at the site claims that 10,000 people viewed the debate--an impossibly large number--if the park was packed with people shoulder-to-shoulder I'd be shocked if more than 2,000 could squeeze in. 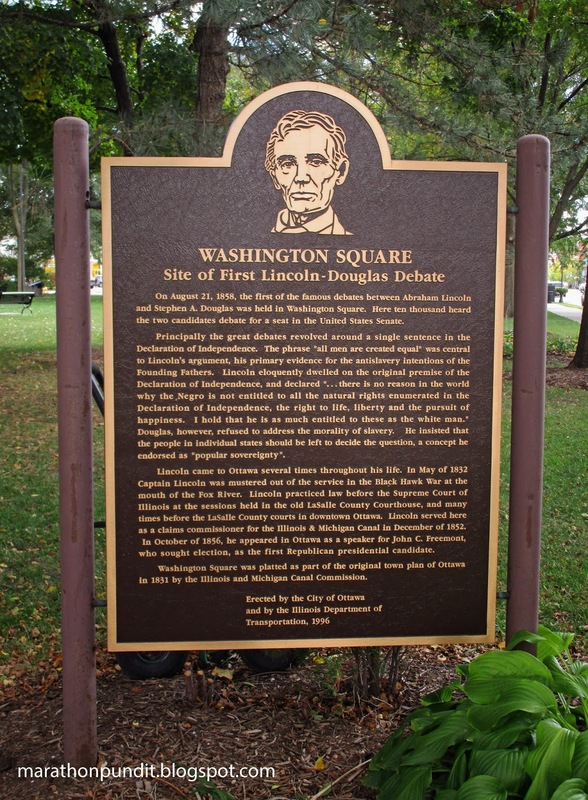 The plaque also notes Lincoln's other visits to Ottawa, including one in 1856 to campaign for the first Republican presidential candidate, explorer John C. Frémont. Spell check is your friend, but not on bronze tablets, Frémont's name is spelled "Freemont" here. Oops. Across the street from Washington Square is this mural. Douglas defeated Lincoln in the Senate race, but the Railsplitter was the ultimate victor. The debates elevated the Lincoln's national stature and despite having scant elected office experience, Lincoln instantly became a contender for the Republican nomination for the next presidential election. The Democratic Party split into northern and southern factions in 1860, Douglas won the nomination of the northern wing--Lincoln easily won the election. As with the debates, slavery was the dominant issue in the '60 race; Douglas favored allowing territories to choose whether they wanted to allow slavery, Lincoln campaigned on limiting it to the states where it already existed. His opinion would change during the Civil War. But what does this have to do with the I&M Canal? While a member of the Illinois General Assembly, Lincoln voted for the legislation that authorized the building of the canal and he remained a supporter of the I&M through his presidency. Twice in his annual message to Congress, Lincoln called for improvements to the canal. Congress failed to take heed, but at the turn of the century the Chicago Sanitary and Ship Canal essentially replaced the I&M. In Ottawa the canal is now as dry as dirt and grass, as it was in the early 1970s when I first visited Ottawa. Like Morris, Ottawa has a replica barge, the Rail Splitter. There were four toll houses on the canal, only the one in Ottawa survives. As recently as 1995 it was a barber shop. It has since been restored to look as it did in the 19th century. 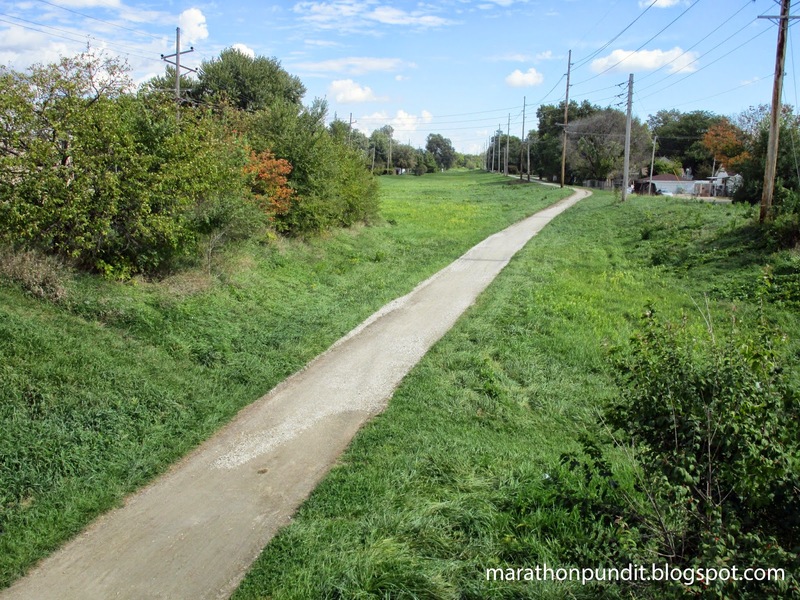 The Illinois and Michigan Canal State Trail is looking fine in Ottawa. This mural honors General William Hervey Lamme Wallace, better known as W.H.L Wallace, an Ottawa lawyer who died at the Battle of Shiloh in 1862. 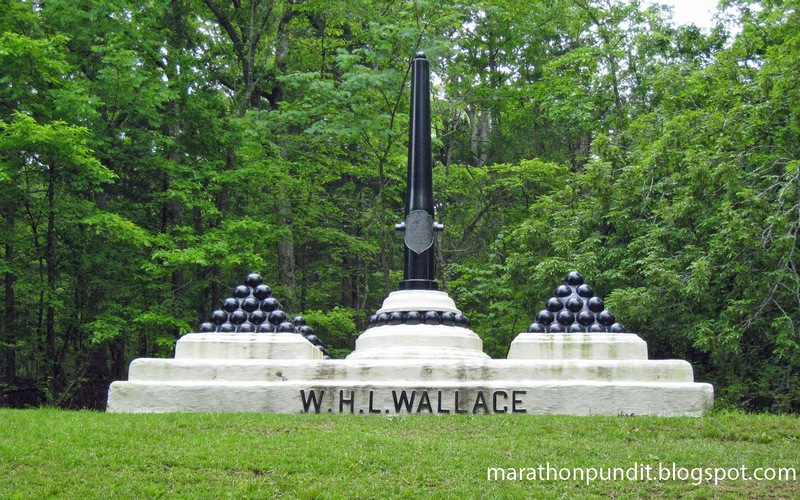 This photograph, taken on a different trip of mine, shows the Wallace memorial at the Shiloh battlefield. 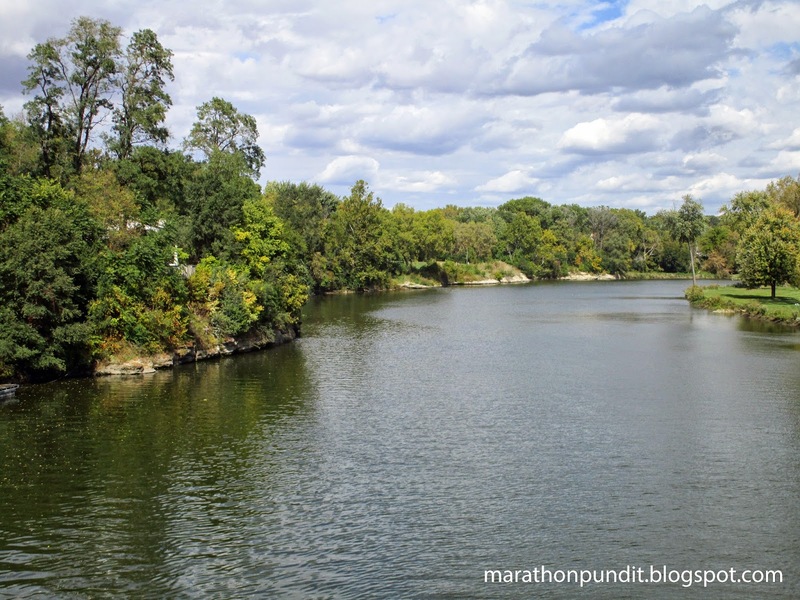 The Fox River, which flows from southern Wisconsin, empties into the Illinois River at Ottawa. 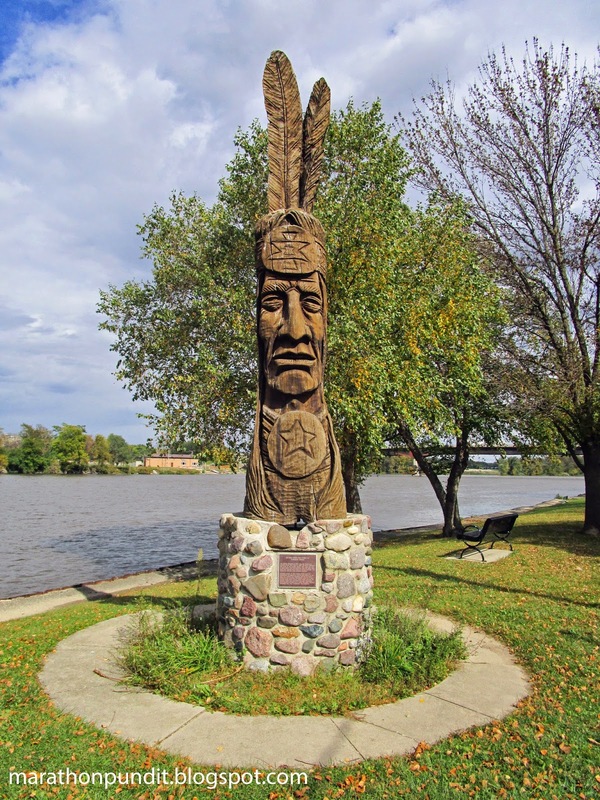 On the southern bank of the Illinois River, you'll find this statue of an American Indian carved by Peter Wolf Toth--there are at least 75 of them in the United States and Canada. Standing Proud, which is part of his Trail of the Whispering Giants series, is also known as Ho-Mah-Shjah-Na-Zhee-Ga. It was carved from oak. Trains superseded canals as a means of transport about twenty years after the completion of the I&M Canal in 1848. 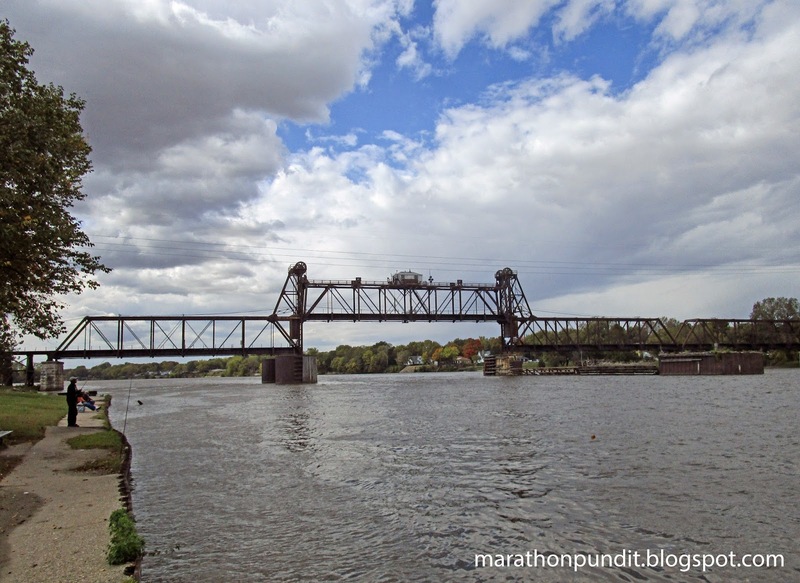 Coincidentally, the Ottawa Rail Bridge, a steel truss bridge with a lift gate, originates from 1868. On the left you'll see a man fishing. It was here where I saw my first Asian carp--one that was as big as my thigh jumped out of the water. 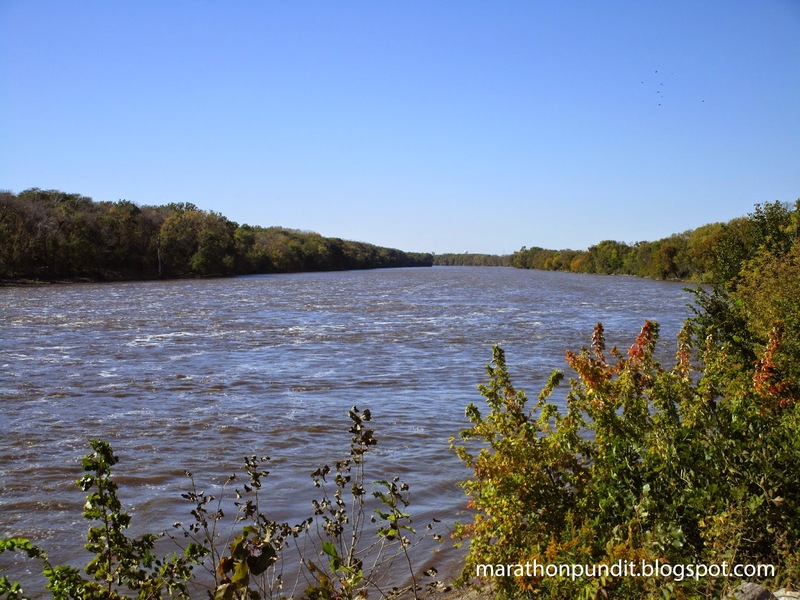 The invasive species now comprises 70 percent of the fish biomass of the Illinois River. (Video) Remembering "A Time for Choosing"
As I noted in the prior post, today is the 50th anniversary of Ronald Reagan giving his "A Time for Choosing" speech. Watch as the Reagan Foundation analyzes the greatest political speech of the 20th century. It was 50 years ago today when Ronald Reagan, an Illinois-born actor widely viewed as a has-been, gave a televised speech on behalf of the Barry Goldwater presidential campaign that became known as "A Time for Choosing." The Republican was clobbered in the election by liberal Democrat Lyndon B. Johnson, but conservatism finally triumphed when Reagan won the presidency in 1980. "We have so many people who can't see a fat man standing beside a thin one without coming to the conclusion the fat man got that way by taking advantage of the thin one," Reagan said that night. "So they're going to solve all the problems of human misery through government and government planning. Well, now, if government planning and welfare had the answer—and they've had almost 30 years of it—shouldn't we expect government to read the score to us once in a while? Shouldn't they be telling us about the decline each year in the number of people needing help? The reduction in the need for public housing?" President Obama needs to watch this speech. The endorsements continue to roll in for political newcomer Bruce Rauner, the Republican candidate for Illinois governor or the incumbent, failed Chicago Democrat Pat Quinn. The fact that Rauner is rich, and a successful business man is in his favor. It means he's had to be decisive, but also has to consider expert opinions before making a decision. That collaborative, but decisive, style is needed in state government. 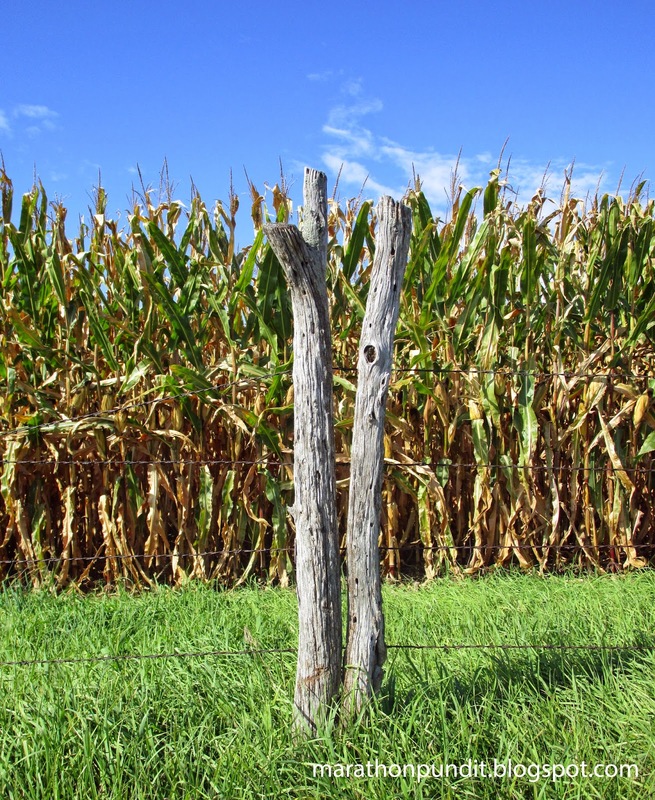 Illinois simply can't afford to remain on the same course. Drastic change is needed and Rauner has the skills to make that change happen. He has earned our endorsement for Illinois governor. For the second consecutive week, my weekly post on Da Tech Guy blog looks at this year's race for governor in Illinois. If you are considering voting for the Libertarian candidate next month, then read my article first, Illinois governor’s race: The folly of voting just to make a statement. The endorsement battle in the Illinois governor's race has become a rout. Pat Quinn so far has not gained a single major newspaper endorsement. This morning's readers of the Quad City Times is the latest to weigh in on the side of Republican businessman Bruce Rauner. 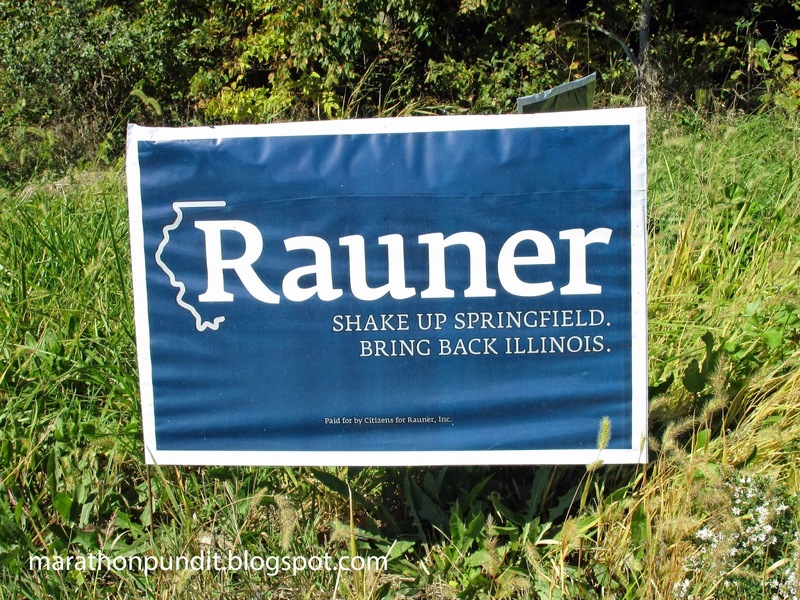 Bruce Rauner's candidacy makes some Illinoisans nervous. The prospect of him in the governor’s mansion leaves some long-time Springfield power brokers absolutely apoplectic. To which we reply: Good. Illinois requires the kind of shake up Rauner promises. Reform the state's awful, unfair education funding formulas. 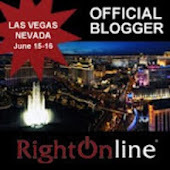 Slash the number of redundant local governments and departments. Revive redistricting reform trashed by House Speaker Michael Madigan. Cut spending. Raise some taxes. 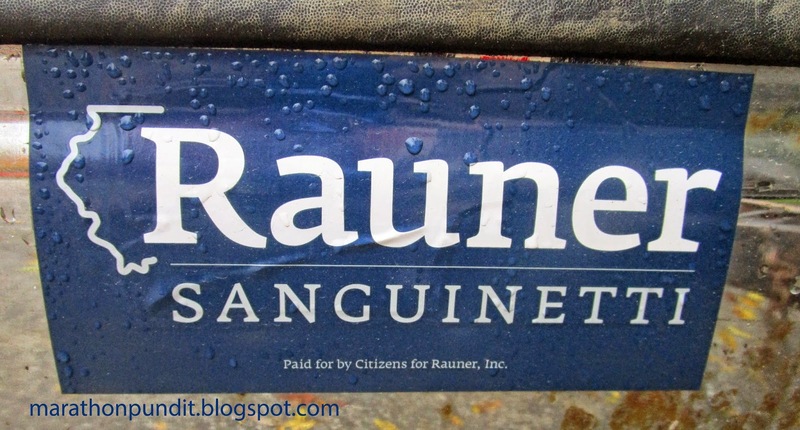 Writing for Chicago Magazine on Monday, Carol Felsenthal noted that all of Illinois' major newspapers had endorsed Republican businessman Bruce Rauner for governor over the incumbent, Chicago Democrat Pat Quinn. All but one, she added, and that paper was the State Journal-Register, Illinois' oldest newspaper and the only daily in the state capital. Well about an hour ago the Journal-Register endorsed Rauner. Rauner, a venture capitalist who makes no apologies for his success, understands the challenges businesses face. He told The State Journal-Register editorial board he believes the state must overhaul its tax code, consider additional workers' compensation reforms, end corporate welfare, implement some business-friendly regulatory changes and make state government more efficient if it wants to create jobs and propel economic growth. Quinn hasn't earned a single newspaper endorsement. Why? He doesn't deserve any. I've seen many brown pelicans in Florida, but until two weeks ago I never saw white ones. 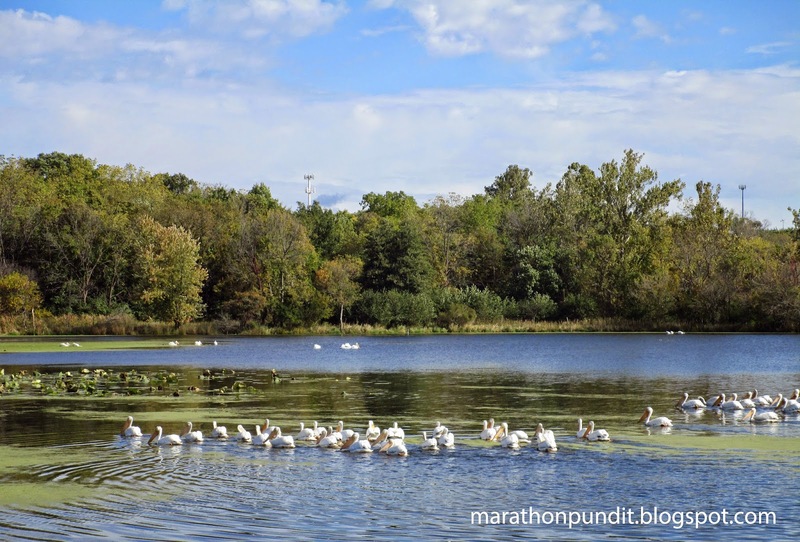 But here is a whole flock of American white pelicans, they were wading in a former bend of the Des Plaines River that is now cut off by Front Street in Channahon, Illinois. These pelicans have the second-largest wingspan of any bird native to North America. 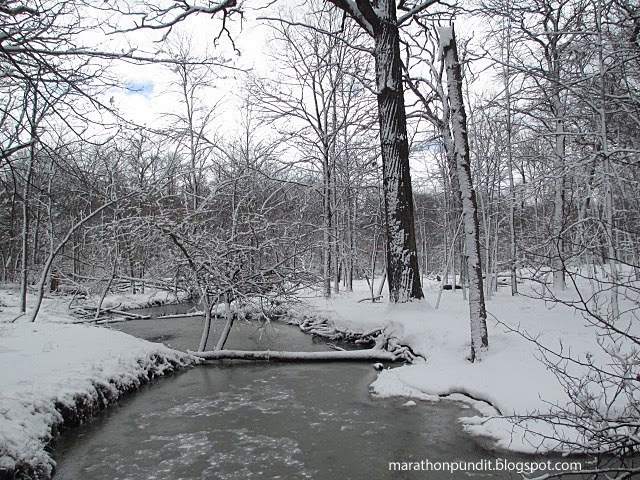 This is how an unnamed creek in Morton Grove's Miami Woods appeared in early March. If you have sharp eyes, you'll notice a couple sitting to the left of the creek. It's hard to believe it's the same place. 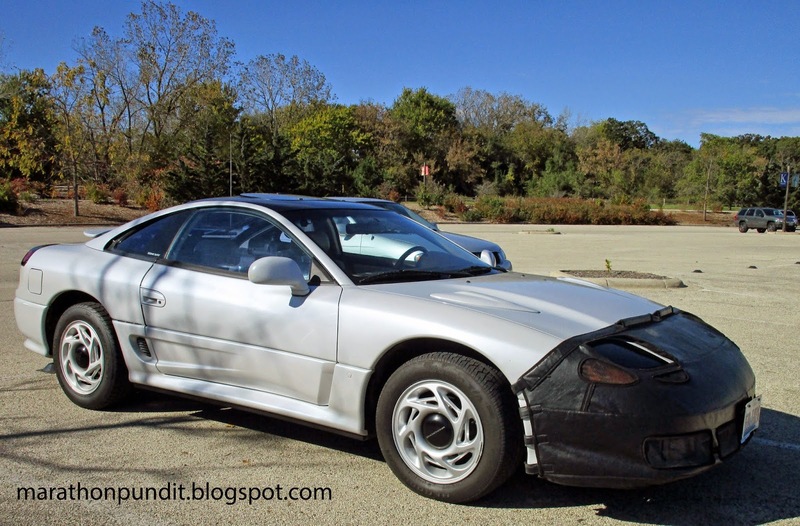 The Dodge Stealth was the Chrysler Corporation's version of the Mitsubishi 300GT. This one is a 1993 model, which I photographed at Independence Grove in Libertyville, Illinois two weeks ago. 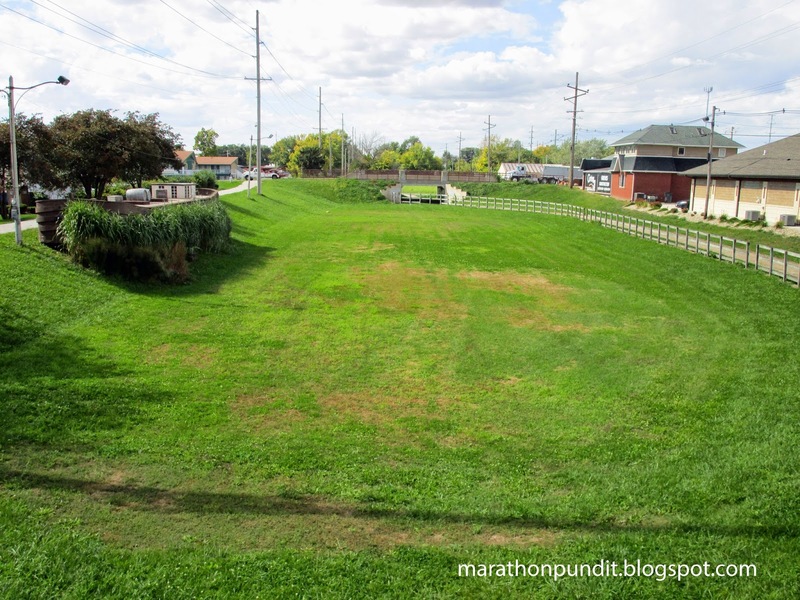 After twelve years of one-party rule in Springfield, Illinois is in a perilous state. The Land of Lincoln is suffering from high unemployment, stacks of unpaid bills, the nation's worst credit rating, and America's largest unfunded pension obligation. Another four years with Pat Quinn as governor will put a stake through the heart of Illinois. The polls are close, so any patriot comprehending voting for Libertarian isn't just throwing away a vote, that person is voting for Pat Quinn. If you think Chad Grimm will be the next governor of Illinois, then you believe in fairy tales. #BringBackIllinois-vote for Republican political newcomer and successful businessman Bruce Rauner. While I believe Wile E. Coyote never captured the Roadrunner in the desert, a pack of them captured an escaped Iowa prisoner, Daniel Rice, who was being treated in a hospital. Rice made it over the Mississippi River into Illinois. Deputies were dispatched after receiving a call about two men being chased by a pack of wild coyotes at the Loud Thunder Forest Preserve in Illinois City, Illinois, according to Steven VenHuizen, chief deputy for the Rock Island County Sheriff's Office. VenHuizen said Rice called dispatch using a false name to report being chased by coyotes. When deputies arrived on the scene, they recognized Rice by the description they had, and a pacemaker scar on his chest. Rice was taken into custody and transported back to the Muscatine County Jail around 8:15 p.m.
Rice has been arrested in Muscatine County three times since July on charges of theft, criminal mischief and burglary. A new charge was filed Thursday for escaping from custody, a class D felony. Coyotes aren't known for attacking humans, but these canines apparently knew this guy was a bad one. Public assistance is supposed to be for the poor. But the entitlement mentality of much of our population, which has been bolstered after six years by our food stamp president, remains entrenched even by those who have benefited from a cash windfall. More than 7,200 Michigan Lottery winners were living in households that received public assistance of some kind in 2013, and the state was able to close about 11 percent of those cases as a result. The Michigan Department of Human Services shared those findings Thursday in its latest "lottery match report," analyzing the impact of a 2012 law that allows the agency to cross-check lottery winnings with public assistance programs and, in some cases, end benefits. DHS identified 7,216 lotto players who won at least $1,000 last year and lived in a household that received food stamps, Medicaid, or some other form of assistance. Their winnings totaled nearly $44 million, or about $6,056 per case. Eighteen cases involved jackpots valued at $100,000 or more. But current state and federal laws only allowed the department to close 810 of the cases, or about 11 percent, according to the report. One case involved a lotto player who won more than $4 million. Michigan's actions have saved taxpayers $2 million. Other states need a similar law to weed out these unworthy recipients of taxpayer funds. Ron Wilson, the former president of AFSCME Local 993 in Vandalia, is supporting Republican challenger Bruce Rauner for governor of Illinois. "Pat Quinn has made so many promises," Wilson says in the ad. "Don't attack Bruce, tell me what you've got done. I see zero." Asian carp now comprise by weight seventy-percent of the fish biomass of the Illinois River. One solution: Build a fish processing plant transforming the unwanted carp into fish meal, bone meal, and Omega-3 oil at the southern end of the river. So far, so good. But the plant utilizes green technology and an odor-free facility was promised. American Heartland Fish Products has 30 days to abate a nuisance odor caused by its fish plant operations or it must cease operations until they achieve elimination of reported and confirmed malodorous smells, an appeal hearing ruling determined Wednesday morning. Grafton Police Chief Chris Sullivan filed the ruling’s written order Wednesday immediately following the appeal hearing’s conclusion. 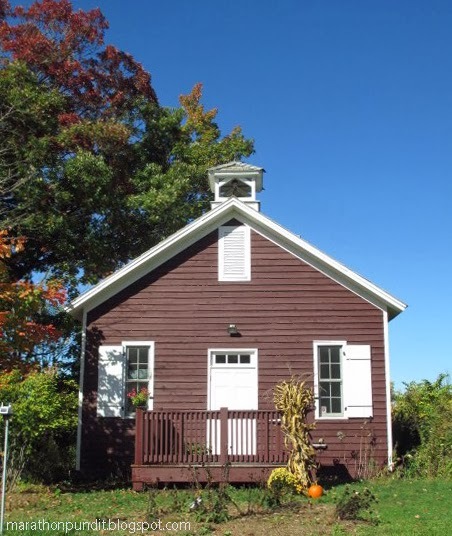 Sullivan presided over the proceedings at the hearing that started at 9 a.m. Wednesday at City Hall on behalf of the city of Grafton. Grafton Mayor Tom Thompson gave Sullivan the authority because the police department has been involved in confirming the presence of odor in proximity of American Heartland's Asian carp rendering plant when complaints were made to city officials. "We, the city, can fine them or shut them down," Sullivan said to people gathered at City Hall to witness the legal procedure. 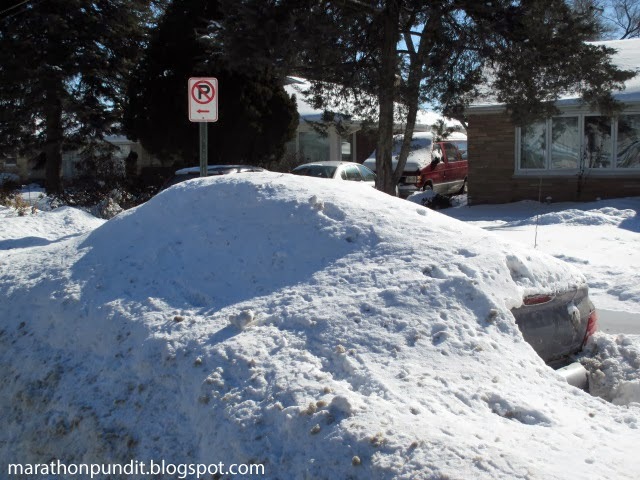 John Coleman, who was my favorite meteorologist in the 1970s during his stay with Channel 7 Eyewitness News in Chicago, is blowing cold air at global warming believers. The co-founder of the Weather Channel is making waves among meteorologists by saying "climate change" is "nothing but a lie." John Coleman, who co-founded the Weather Channel in 1980, says that the theories of man-made climate change are no longer credible in light of the so-called hiatus in rising temperatures, not to mention that "polar ice is increasing, not melting away." Coleman adds, "Polar Bears are increasing in number." 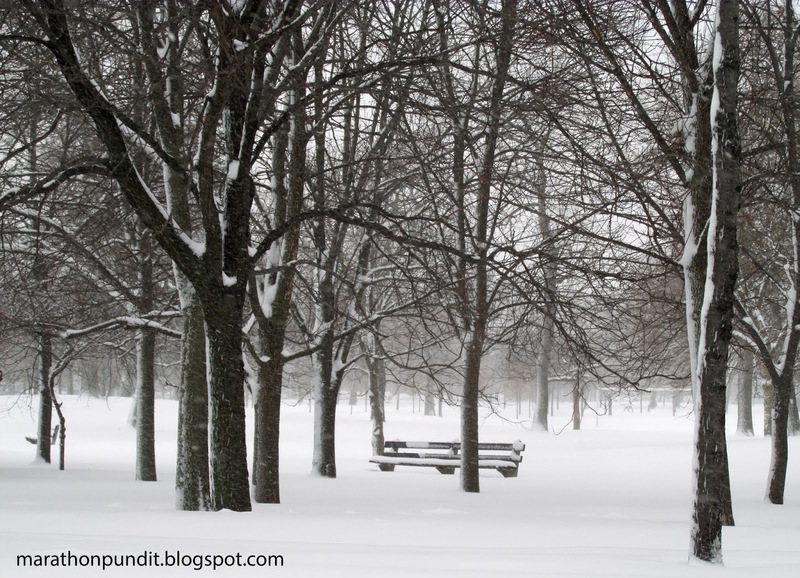 "Heat waves have actually diminished, not increased. There is not an uptick in the number or strength of storms (in fact storms are diminishing)," Coleman recently said. "I have studied this topic seriously for years. It has become a political and environment agenda item, but the science is not valid," he declared. Coleman adds snow to the fire by singling out the 18-years-and-counting pause in "global warming" and by dismissing the role of humans in "climate change." I'm not sure if this barbed wire, using tree branches as posts, is vintage or vintage style. I believe this land is part of Dollinger Farms, which is a bit west of Channahon, Illinois. It does look pretty snappy. Oh, a vote for the Libertarian candidate is a vote for Quinn. The survey found Rauner with 45 percent support and Democratic Gov. Pat Quinn with 43 percent. That's within the poll's 3.5 percentage point margin of error. Little-known Libertarian candidate Chad Grimm had 4 percent, while only 7 percent were undecided ahead of the Nov. 4 election. A new Tribune poll reveals that Gov. 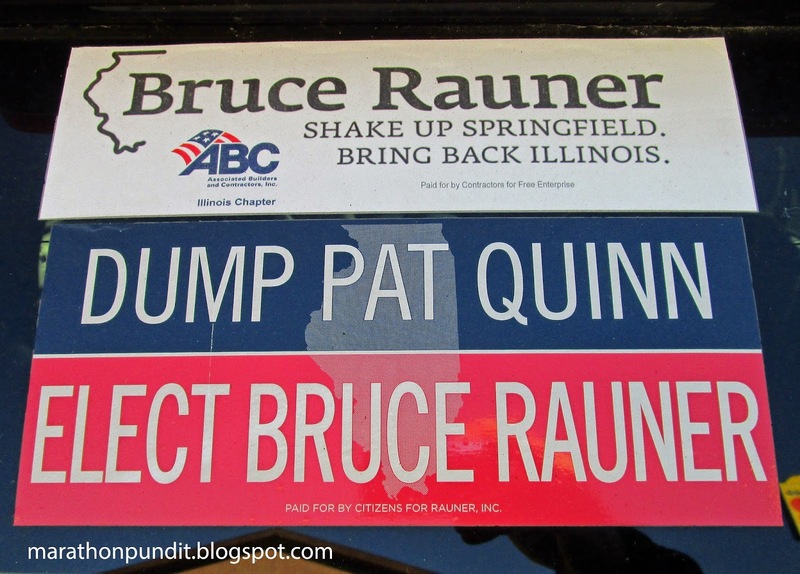 Pat Quinn and Republican challenger Bruce Rauner are in a 'dead' heat in the governor's race. Tribune reporter Rick Pearson explains the data. The findings represent a sharp turnaround from a similar survey conducted Sept. 3-12 that found Quinn with an 11 percentage point advantage over Rauner. The governor's race has tightened as voters become more focused on the campaign and both sides bombard the airwaves with tens of millions of dollars' worth of negative attack ads on television, radio and newspaper websites. A single Chicago TV station, ABC-7, reported that more than $565,000 was being spent this week to air nearly 300 commercials. As for Quinn, 43 percent is a terrible place for an incumbent to be in. However, in 2010, Republican Bill Brady led most of the polls over Quinn. Chicago Democrat Pat Quinn suffered a big defeat today--and it involves his patronage cesspool at IDOT. A federal judge on Wednesday ordered a court-appointed monitor to review hiring problems at Gov. Pat Quinn's Department of Transportation, a setback for the Democrat running for re-election largely on how he navigated Illinois away from ethical problems. Quinn's opponent in the election, Republican Bruce Rauner, said during a campaign stop Wednesday in O'Fallon that the ruling is a major development that could swing the gubernatorial race. Rauner said if he's elected, he'll work with the court-appointed monitor to root out patronage at IDOT. "I knew there was a lot of baloney going on in there," Rauner told a group of about 50 supporters at an O'Fallon conference center. The ruling -- less than two weeks before the election -- followed a motion filed in April by anti-patronage campaigner Michael Shakman, who alleged that a long span of improper hiring based on clout and connections necessitated an outside monitor and further investigation at IDOT. Quinn administration attorneys had argued that neither was necessary because a state inspector general had investigated and the issues already were being addressed. Long-suffering Illinoisans deserve a better governor: Republican Bruce Rauner. This morning a convert to radical Islam, Michael Zehaf-Bibeau, murdered Canadian soldier Nathan Cirillo in front of the National War Memorial in front of the parliament building. The nutjob later fired shots inside that structure. Stephen Harper, Canada's prime minister said the murder was "a terrorist act." 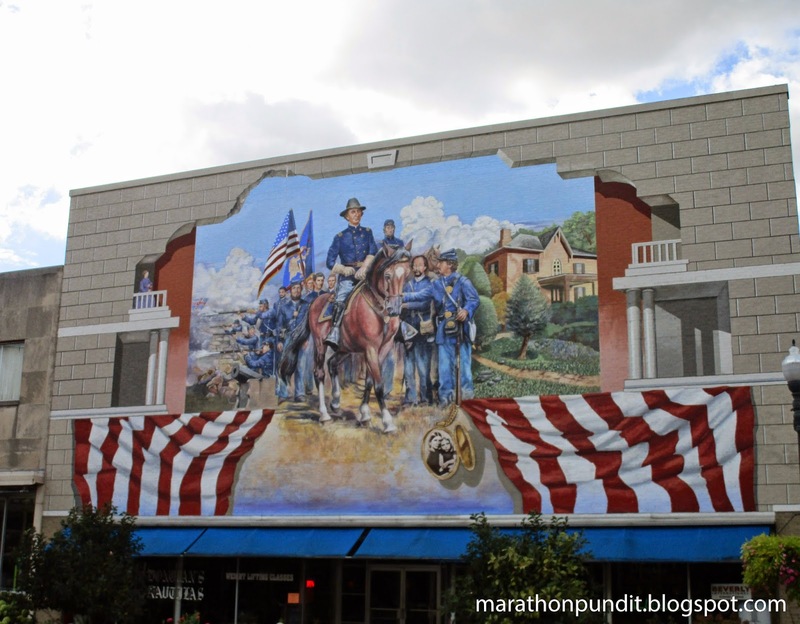 Five years ago, evil psychiatrist Nidal Hasan, murdered 13 soldiers at Fort Hood, Texas. He wounded 19 others. The Obama administration, bowing to political correctness because Hasan is a Muslim, deemed the bloodbath "workplace violence." But today President Obama also called the murder of Cirillo a terror attack. We have a hopeless president. 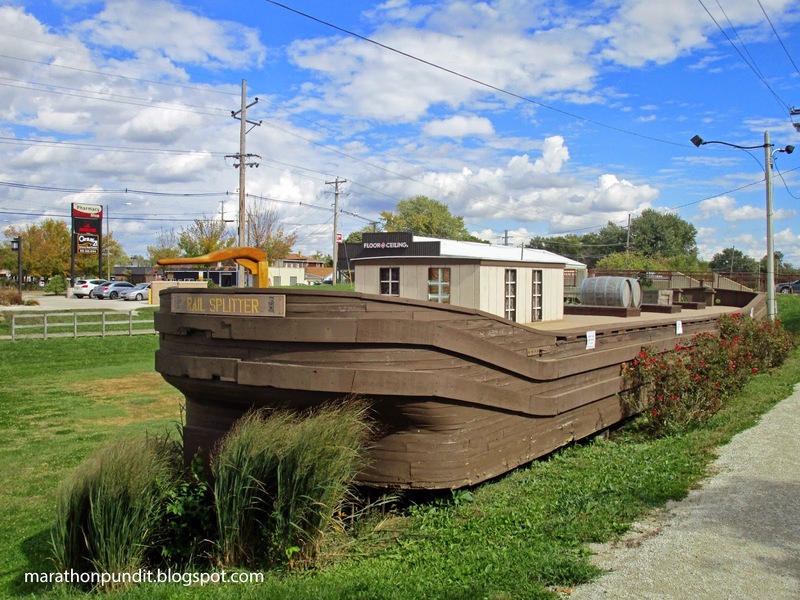 The Illinois & Michigan Canal National Heritage Corridor was created thirty years ago and the canal was completed in 1848. But the newest site of renown along the corridor is also celebrating an anniversary. 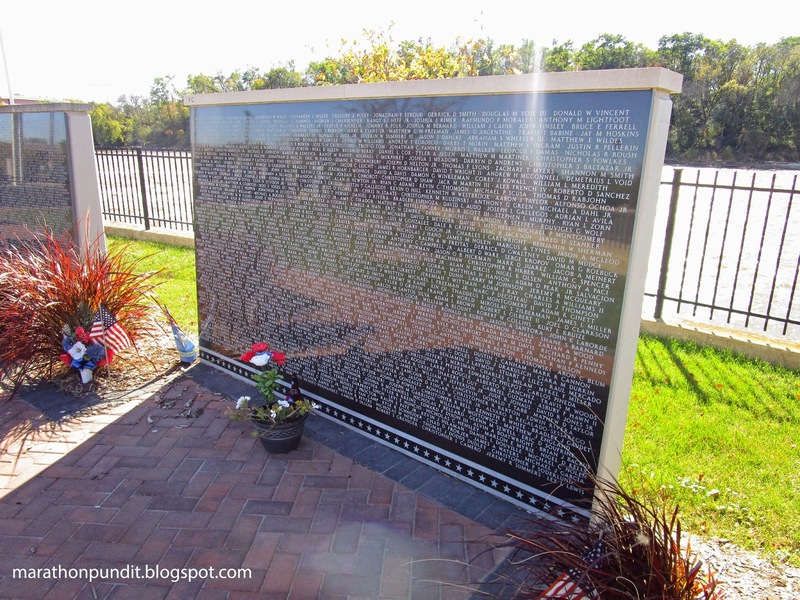 In 2004 the first granite panel honoring the fallen soldiers and sailors from the Middle East wars since 1979 was placed at Riverfront Plaza in Marseilles, the Middle East Conflicts Wall Memorial. The memorial is a difficult photographic subject--particularly on a cloudless day with the sun at the south. The ray of light is an accidental optical effect, but one that is appropriate for this hallowed place. Some lighting trickery is in this photograph too. The Middle East Conflicts Wall Memorial is unique in at least two ways. It's the first memorial in American history to honor those men and women who made the ultimate sacrifice to our nation by name while the conflict was still ongoing. And it's America's only monument to all of the fallen in our wars in the Middle East. No government funds go to the memorial. 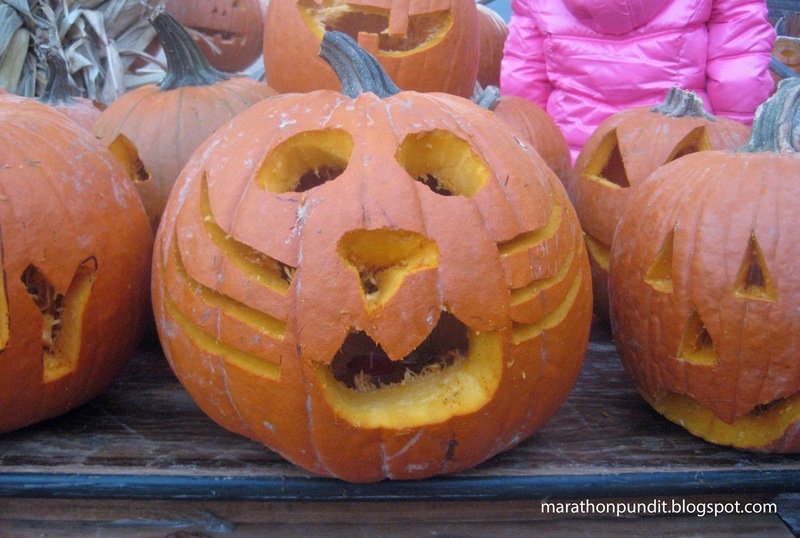 Donations and volunteer labor keep it going. If government was involved, I'm certain such a monument would still be in the planning phase. 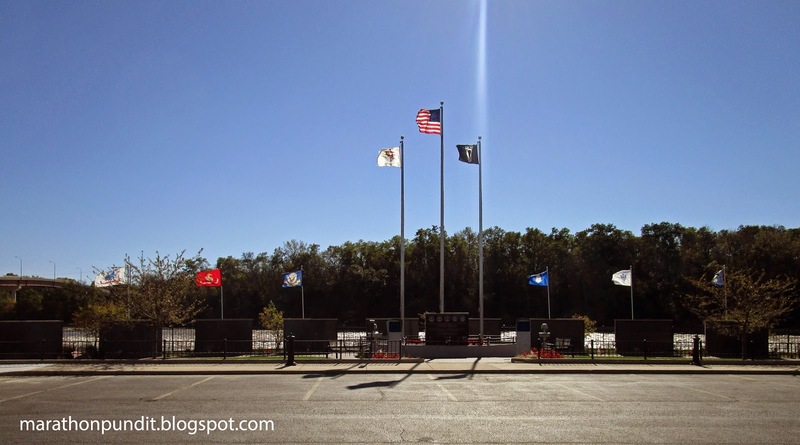 The idea for the memorial developed from the annual Illinois Motorcycle Freedom Run. When the biker rally occurs, the population of Marseilles swells from 5,000 to 50,000. 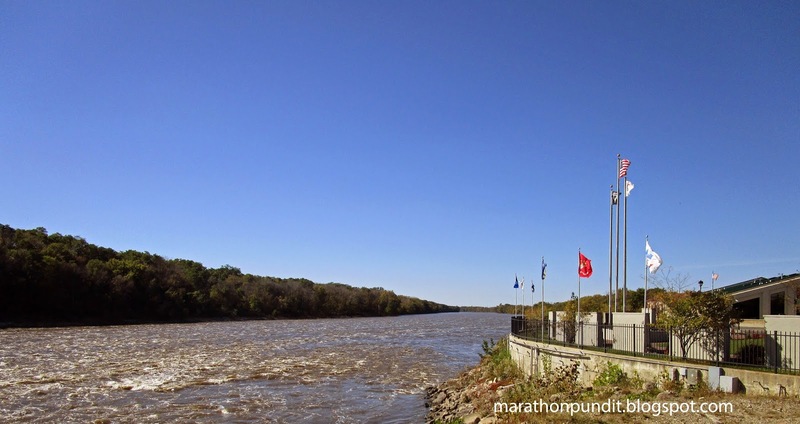 To the south of the memorial are rapids of the Illinois River. On the opposite bank of the river lies Illini State Park. The names of over 5,000 men and women who made the ultimate sacrifice for America are carved into the several granite plaques at the memorial. 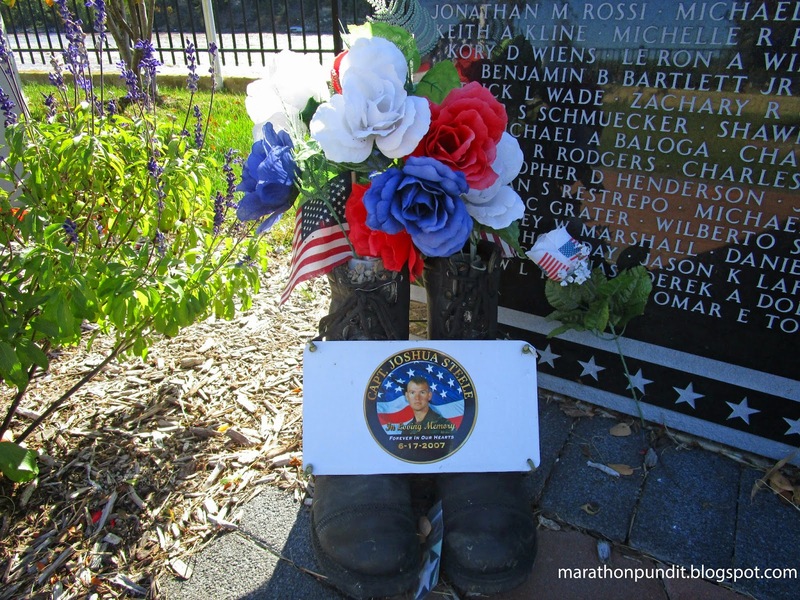 A complete listing of those brave warriors can be found here. 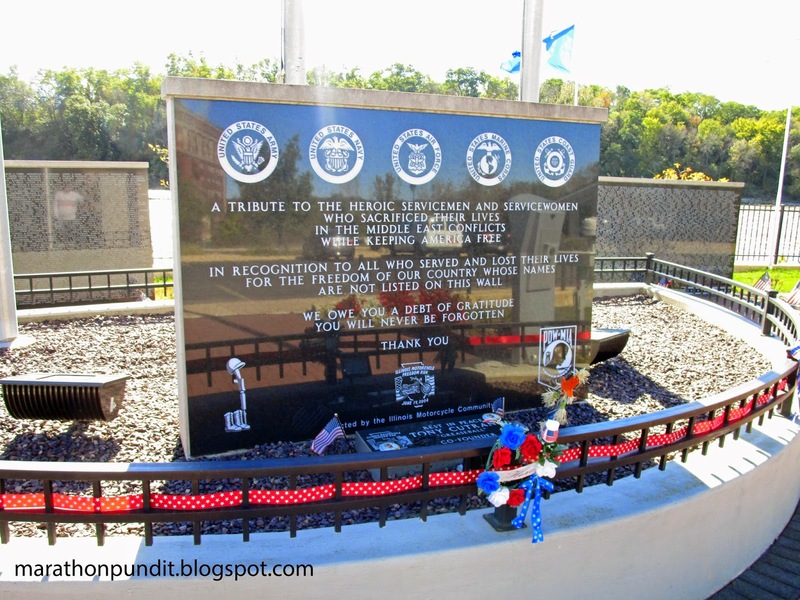 The center granite marker reads, "A tribute to the heroic servicemen and servicewomen who sacrificed their lives in the Middle East conflicts keeping America free. In recognition to all who served and lost their lives for the freedom of our country whose names are not listed on this wall. We owe you a debt of gratitude. You will never be forgotten. Thank you." 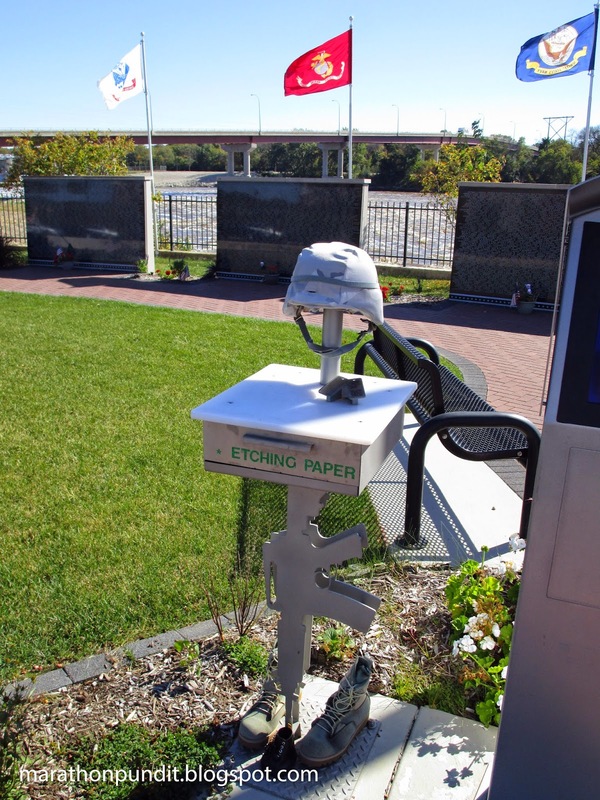 As with the Vietnam Veterans Memorial, etching paper is available for those who want to preserve a copy of a name on the wall. There were a few individual memorials at the base of the plaques, such as this one to Captain Joshua Steele, who perished on June 17, 2007. 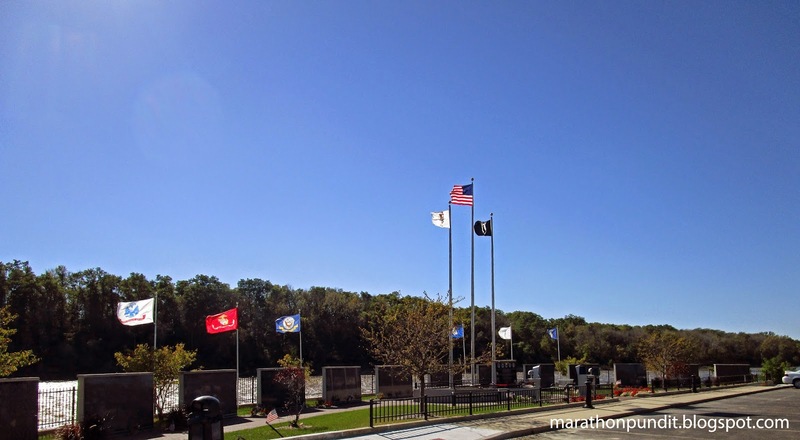 The Middle East Conflicts Wall Memorial is only five miles south of Interstate 80. If driving down this major cross-country thoroughfare, I urge you to visit and pay your respects to these brave men and women. To donate to the Middle East Conflicts Wall Memorial, click here.